Lighful (L): Lightful is a social impact start-up helping charities and beyond profits get the most out of technology. SMP: What regions was the campaign for? SMP: The official campaign name and why was it chosen? L: The campaign was called #ReclaimSocial. Our campaign was built around getting people to reclaim social media for good, so we wanted our campaign name to be snappy and work effectively as a hashtag on social media. We went with #ReclaimSocial as it's rousing and active, and encourages people to find out more and get involved. SMP: What was the start and end of the campaign? L: The main push is from 06/02/2018 to 12/02/2018. 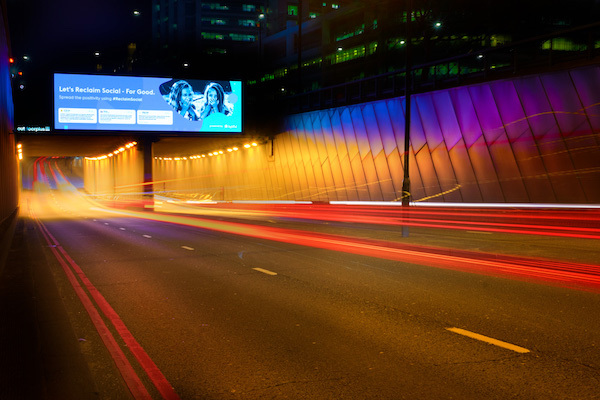 SMP: The target audiences of the campaign, who are you trying to reach and why? L: Our primary audience was people in the beyond profit sector (e.g. charities and social enterprises), as we wanted to encourage them to share their inspirational stories on social media. We also targeted social activists and other groups of people who are passionate about making the world a better place, many of whom have strong followings on social media because of their outspokenness. L: There's a lot of negativity on social media nowadays. Whether it's fake news or just angry people - all this negative noise has taken over social platforms. But it's not all bad and there are examples of social media being used for good. The #MeToo campaign is giving a voice to millions of women; and $274 million in donations was raised online in 24 hours on #GivingTuesday. On top of this, countless charities and social enterprises are amplifying their impact through social media. That's why we want to #ReclaimSocial, to move away from the negativity and make social media a force for good. SMP: What were the goals of the campaign and why is it different? L: The objective was to create a movement on social media that people could get behind and support. Specifically, we wanted to see people spreading inspirational stories of good people and great causes. By using a Thunderclap mechanic, where everyone posted their message at the same time, we wanted #ReclaimSocial to be one of the most talked about things that day. The campaign was unique because it gave a voice to hundreds of smaller charities and social enterprises who otherwise risk being drowned out on social media. SMP: What were the channels, platforms and methods you're using? Social media ads to encourage people to sign up to our Thunderclap which kicked off the campaign. An online display advertising on third sector publications. Social media marketing on Facebook and Twitter. 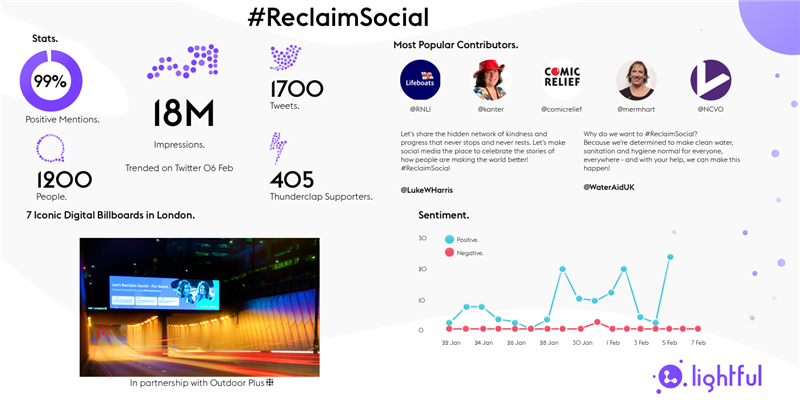 Seven digital billboards around London, which were linked to Twitter, displaying the #ReclaimSocial campaign messages in real-time (donated by Outdoor Plus). PR, the day after the official launch of the campaign, we landed articles in third sector media, announcing that the campaign had gone viral, and encouraging more organisations to join the movement. SMP: What did you hope to achieve? L: We wanted 500 people to get involved in our campaign and achieve five million impressions. Since then, we have had 1230 people and organisations participate in the campaign and over 18.5 million impressions. We also managed to trend on the morning of the campaign launch. We also wanted major third sector publications to write about the movement, which happened - and they all hailed the campaign as a huge success. SMP: What were the challenges in creating the campaign and how did you overcome them? L: One of the biggest challenges was deciding how we wanted people to get involved because we were targeting organisations and people. The solution was to agree on a simple ask that didn't confuse or polarise different audiences. SMP: What did you do to measure the campaign and what measurement tools do you have in place to do this? L: We used different tools such as Brand24, TweepsMap, TalkWalker and Keyhole to measure total tweets, Facebook and Instagram posts, impressions, reach, sentiment, number of participants, microsite visits and Thunderclap supporters. SMP: What was the budget used for the campaign? SMP: How did you make the campaign social and shareable? L: We encouraged people to participate by making sure the ask was something any person or organisation could do. It was also important to make sure that we reminded people that by sharing their good stories, they were helping to make social media a more positive space. We directed people to the microsite where it was made very clear how you could share the campaign, and it took less than 10 seconds for people to sign up. SMP: Are there any dedicated hashtags or social media profiles for the campaign and how/why did you chose these? SMP: Is there anything else we should know, or is there anything in particular that you'd like to share about the campaign? L: The campaign isn't over, we're determined to make this movement bigger and bigger. Please get involved in the campaign and share stories about good people and great causes that inspire you using #ReclaimSocial. Since the campaign has finished we've been approached by other like-minded campaigns, such as #LoveNotHate, who asked us to partner up on Valentine's Day. We worked with people who were sharing on #100years on the suffragette campaign last week. This is what will get us to really achieve our overarching aim to be part of fundamentally making social media used as a force for good. Got an interesting campaign to share? Get in touch.